My family and I are vacationing in Colorado, and today we climbed Pikes Peak. Our Jeep did the actual climbing. But we successfully steered the vehicle skyward, to the mountain’s 14,115-foot summit. The 19-mile drive demands a stealthy crawl in low gear, up an increasingly steep two-lane road. At first you snake through trees. Once you pass the tree line, it’s all rock, road and sky. 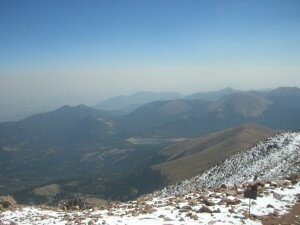 The summit at Pikes Peak. It’s very quiet up at 14,115 feet. Peering over the sharp drop outside my window, I realized nothing separated us from death. Nothing except Matt’s skilled driving, and God. I prayed that we’d make it up the mountain safely. We passed four or five people biking their way to the top, and we marveled at their sheer endurance and uncommon strength. One bad move, and they too would be dead. Landing at the summit, we struggled to breathe as we bundled up in the rarefied, 33-degree air. A few other voyagers joined us, snapping photographs and soaking up the views. Inside the Summit House we grabbed hot dogs and chicken sandwiches, and downed bottles of water and Gatorade. “Drink as much as you can!” the shop keepers advised. They reminded us that each person loses a liter of water while ascending the mountain. A headache settled in fast. I was light-headed in a way that made me unsteady on my feet. Matt started to doze off as he was eating, and Syma did fall asleep. Noah was the only one unfazed. I looked around to see Pikes Peak paraphernalia reading, “Got Oxygen?” It’s hard to breathe when you get up that high. So difficult, in fact, that I reminded myself to take deep breaths. I noticed something else as I sat there, dazed. The quiet. An otherworldly stillness swallows you. In a comforting way that makes you feel closer to God. You don’t have to drown out the deafening din of humanity to hear His voice. In the stillness, it’s easier to hear Him. As we descended the mountain, I considered the duality I discovered. It’s harder to breathe on a mountaintop. But it’s much easier to hear. God’s voice, your own tangle of thoughts–everything is clearer when you leave the fray. That truth is playing out in my life. Growing up without a mom is like breathing thin mountain air. I’ve often felt like the odd girl out. Many peers can’t relate to the awkwardness, to my special brand of loneliness. It’s uncomfortable, being motherless–more or less so, depending on where you are in life. But it doesn’t go away. Just as you drink water and eat well to combat altitude sickness, so you make adjustments to survive as a motherless woman. You learn to mother yourself. To protect yourself, especially emotionally, from others who could hurt you. You adapt to the rarefied air. Along the way, you discover that rarefied air is a gift. Inconveniences and all. Without a mom, I developed resilience and self-reliance. These would’ve been harder to come by if my mom had lived. She spoiled me, and let me get away with things no one else did. Her death kicked up a gritty reality, one where I learned to appreciate the bumpy path. It made me stronger. Still does. Life without a mom also breeds new sensitivities. You notice things other people don’t. I was reminded of that on this trip. On the first leg of our journey, we went to the Denver wedding of one of my oldest friends, Amy, and her Jacob. As a bridesmaid, I spent the hours before the wedding with Amy and Jacob’s families, taking pictures with the wedding party. Amy and Jacob’s moms were most interesting to me. Watching them interact with their children, the emotions playing across their faces in ways unexpected and delightful. I found it fascinating. Two very different women, it seemed, yet alike in their boundless love for their kids. Nobody loves you like your mom. That’s so evident on your wedding day, even if your mom’s not around. As the day unfolded, I grew wistful. I wondered what it would’ve been like to have my mom at my wedding, chatting with my friends, my new in-laws, helping me into my dress. Even as I was entirely thrilled for Amy and Jacob–they’re a perfect pair–I was sad. I missed my mom in yet another setting. For new reasons. But the melancholy didn’t last. Amy’s photographer led us to the Denver Opera House for a photo shoot. As our heels carefully click-clacked on the hot pavement, the photographer stopped. “Hey, that’s my mom!” he said. A smartly dressed woman who resembled him dashed over and said, “I hope you don’t mind, but I just want to give my son a hug!” I said to myself, “One day that will be Noah and me. I will find him ensconced in the work he loves, and unabashedly brim with love, with pride.” I suppressed tears. How odd it’d be, gushing over such a happy scene. No one else would get it. Yet God’s voice is clear to me now, as I sit at the foot of the Rockies. He might lead us up a mountain, might let us suffer through thin air. But just when you think you’re going to faint, He lifts you up. To a new height, where you experience Him in ways you’d never imagine. What great insight Kristina. I cannot imagine life without a mom… and the things you notice because of that. What I noticed last weekend was an incredibly close family of four with two parents who love their children deeply. Noah and Syma are so incredibly blessed to have such an insightful, purposeful and loving mom. And your friends are better for the ways you touch their lives. I am sad that I was so ensconced in being a mom and wife and bridesmaid and sister-in-law and daughter-in-law that I missed your sadness. I didn’t take the time to truly soak in the moment as you did. I am grateful for your reflections here. And the reminder that motherhood is sacred… both from the perspective of mom and the perspective of daughter/son. Thank you for your kind words–and for your wisdom. You’re an exemplary mom. I shy from the term “supermom,” so I will instead say that you are a savvy-cool-loving mom. You accomplish so much for your three darling babes, and you make it seem effortless and fun. As your kids grow, they will reflect on their childhood and call it blessed. May God continue blessing your family! Years ago, I experienced the PIKES PEAK climb and had a strong, clear moment of faith that stays with me to this day–I felt God’s presence and only His! The environment was that majestic and still. Each time, I look at my photos from that awesome day, I feel it all over again. What a gift to have the so-called mountaintop experience. God doesn’t tend to bonk us on the head with His truths. 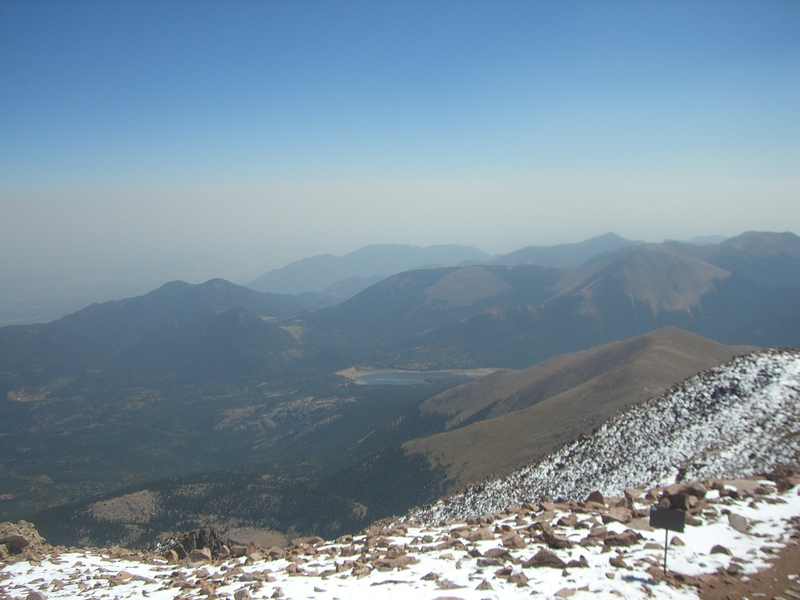 I find that He often speaks in the quiet, still moments, with a lasting effect–as your Pikes Peak journey attests.